Use the parking brake to keep the vehicle stationary when parked. You can manually apply and release, or automatically release it. 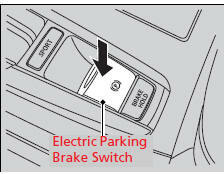 Use the electric parking brake switch to apply or release the brake. Manually releasing the parking brake using the switch helps your vehicle start slowly and smoothly when facing down hill on steep hills. - The electric parking brake indicator comes on. 2. Press the electric parking brake switch. You may hear the electric parking brake system motor operating from the rear wheel area when you apply or release the parking brake, or set the power mode to OFF. This is normal. driving, the parking brake is applied. • When the vehicle stops more than 10 minutes while ACC with LSF is activated. • When the driver’s seat belt is unfastened while your vehicle is stopped automatically by ACC with LSF. • When the engine is turned off while ACC with LSF is activated. • When the vehicle stops with the automatic brake hold system activated for more than 10 minutes. 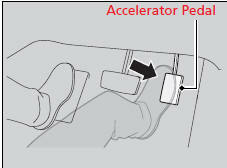 Use the accelerator pedal to release the brake when you are starting the vehicle facing uphill, or in a traffic jam. - The electric parking brake indicator goes off. 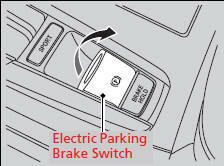 You can release the parking brake automatically when: • You are wearing the driver’s seat belt. • The engine is running.> • The shift lever is in any position other than or .